If you grew up in the 1950s, the 1960s, or even the 1970s, heavy immigration seemed mostly a chapter from the American past, narrated to the nostalgic strains of The Godfather or Fiddler on the Roof. The Ellis Island immigrant-inspection station—through which flowed the ancestors of so many of today’s Americans—closed in 1954. It reopened as a museum in 1990. After trying to get you to sympathize with Fox News’ key demographic, he launches into his argument that sorely lacks context. Yet rather than fading into history, immigration has only been accelerating. From 1990 to 2015, 44 million people left the global South to find new homes in the global North. They came from Latin America, Africa, and Asia. The Migration Policy Institute has a chart that demonstrates how people like Frum either don’t understand the policy they are critiquing, or they do and are couching a (racist) ideological argument in a (bad) logical assertion that implores you to pay attention to the blue line below while ignoring the far more contextualized orange line. Frum is correct in the big picture sense (although his decades are just off—it’s more like the 1940s to 1975), but as you can see, depicting that massive blue spike as “heavy” is far less descriptive than “normal.” We currently have a lower immigrant population, on a percentage basis, than we did a century ago—which was the normal level for most of the century preceding it. The era that Frum cites as idyllic is objectively an outlier. Frum wants his readers to get inside the minds of a “the immigrant hordes are coming for our jobs” Fox News viewer so we can sympathize with them, when their worldview is simply incorrect and lacking vital context. Yes, the rising immigration rate of the late 20th and early 21st centuries is a dramatic deviation from what baby boomers experienced in their childhood and adolescence. But it’s not a dramatic deviation from longstanding pre-1940 and post-1975 immigration levels. Immigration began to sharply rise in 1975 (when the oldest baby boomer was 29, and the youngest was 11) and really accelerated in 1990 (spanning 26 and 44 years old). There is a balance between the need to acknowledge a childhood lived in a different reality than the one that boomers have lived in post-adolescence, but what Frum does with that opening framing—plus the thousands of words of (false) vacuous BS below it—is to essentially make the Peter Pan argument, all while fundamentally misunderstanding the country he purports to speak on behalf of. Holy hell does this deserve a good fisking. For the uninitiated, “fisking” is a column within a column about a column. The wordbarf coming from the former George W. Bush speechwriter who provided the rhetorical foundation for our Vietnam-like debacle in Iraq—comparing Saddam Hussein to our World War II enemies, and naming Iraq as part of a (not) allied “Axis of Evil” that comprised North Korea (??? ), al-Qaeda (who believes in a literally opposite form of Islam than Hussein did) and Iran (whose 8-year war with Iraq had come to a close just 13 years before Frum declared them to be allies)—has a grey background, while my barely-checked rage is in white. This doubles as the thesis of Frum’s piece, and all you really need to know about the Democratic Party from 1980 to today is that George W. Bush’s former speechwriter/current MSNBC contributor, cited the 2016 Democratic nominee for president in a nativist rant against immigration based on faulty logic. Many immigrants are poor and desperate, especially refugees fleeing war or famine. There are paragraphs upon paragraphs of bloviation about the political difficulties of rising immigration (because lots of people are racist, but Frum cannot go as far to say that, so instead he lays the blame on policymakers for not kowtowing to people’s racism—because you know, compromising with the political priorities of racists is definitely how the 1964 Civil Rights Act was passed), but I just wanted to single out this one sentence to highlight how Frum views the world. Let’s move on before I smash something. Oh so we’re just going to come right out and point directly to the white supremacist 14 words, huh? Almost half of white Millennials say that discrimination against whites has become as big a problem as discrimination against blacks and other minorities. Whites under age 30 voted for Donald Trump in 2016 by a four-point majority, according to CNN exit polls. In European countries too, notably France, the parties of the far right are appealing more and more to the young. More BS framing on the part of an Iraq War architect to push an easily disproven political argument. Yes, many young white people are conservative like old white people, but there’s a reason why Frum is silent on young women, or anyone who isn’t a white man in the most diverse, and largest generation in human history (the top right chart doubles as the scariest thing GOP consultants have ever seen). Again, there is a nuanced debate to be had about how different the world is now from only 40 years ago, and how immigration influences the economy—Frum is just one of the last people on Earth who should be making this case—or any case, really. There is a direct line between MSNBC employing George W. Bush’s former speechwriter while giving George W. Bush’s Communications Director her own show (Nicolle Wallace) and President Trump. When we forget the mistakes of the past, we are doomed to repeat them in the future, which means that we should all brace ourselves for Michael Cohen’s Very Serious primetime hour on MSNBC critiquing President Kid Rock’s invasion of Canada in 10 years. America was built on the revolutionary idea, never fully realized, that those who labor might also govern—that every worker should be a voter. The struggle toward this ideal has been slow, arduous, and sometimes violent. The immigration surge has had the effect of setting this ideal back. Half a century after the Voting Rights Act of 1965, the United States has again habituated itself to employing workers who cannot vote and therefore cannot protect their interests or even their lives. Here’s the money quote, folks. This mind-boggling stupidity is really what made Frum’s column go viral this morning—as this is hilariously misguided on a few tracks—so let’s end this fisking with a quick history lesson for George W. Bush’s former speechwriter/man whom the “liberal” cable news network pays good money to spout “expert” opinions. 1) It was not built on that idea. One of the first things written into the constitution was slavery. The entire reason the 13th Amendment exists (read: not one of the ten original ones) is to overturn this fundamental injustice intentionally baked into America's founding document. We are, by the Founding Fathers' stated intent, a slave-owning nation. How can Frum say with a straight face that we aimed to let labor govern as our foundational principle? Who the hell gave this man a history degree? Oh, Yale? A Masters? Really??? Wow. This is a helpful reminder that degrees—especially at elite institutions—are more indicative of class status rather than an inherent sign of intelligence. Secondly, the constitution did not say who can and cannot vote, and instead left that up to the states. The states ultimately decided that only property owners were eligible to vote. That's why women haven't even had the vote for 100 years yet, so I repeat: I don't know what the hell Frum's talking about when it comes to our supposed goal of having laborers control all the power in this country (which again, is literally socialism). Frum propagates the same propaganda so many of us have been poisoned by, asserting that this country is something its founding document says it is not. As Frum's much more intelligent colleague, Adam Serwer, wrote in his must-read essay about the history of the Supreme Court in The Atlantic, the “never fully realized revolutionary ideas” Frum speaks of are something we have had to fight against America's foundation in order to acquire. Things are a struggle for non-white male non-property owners by design, per our founding document. Not to be that guy, but this situation calls for me to be that guy. Know who also pined for immigration policy like the 1924 Immigration Act? There is today one state in which at least weak beginnings toward a better conception [of immigration] are noticeable. Of course, it is not our model German Republic, but [the US], in which an effort is made to consult reason at least partially. By refusing immigrants on principle to elements in poor health, by simply excluding certain races from naturalization, it professes in slow beginnings a view that is peculiar to the People’s State. Congratulations to The Atlantic on yet another column gone viral for all the wrong reasons, written by a man who should have been banished from any perch of expertise long ago. It sure is a mystery as to why the great Ta-Nehisi Coates no longer writes for a publication edited by an Iraq War cheerleader who put an ahistorical, nativist rant made by an Iraq War architect that could have easily been delivered by Fox News’ Tucker Carlson on the cover of The Atlantic. What a disgrace. 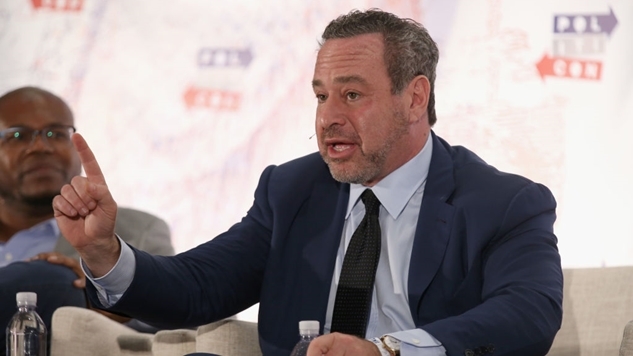 Any liberal who cites David Frum in any capacity is embarrassing themselves.